Tales of Another Direction Vol. 1 & 2 | Vinyl 41 - Platten uvm. Als ich vor kurzem Tales of Another Direction Vol. 2 das erste mal in den Händen hielt, ist mir aufgefallen, dass ich zum ersten Teil nicht ein Wort in dieses Internetz geschrieben habe. Das hole ich dann hiermit auch gleich mal nach. Von beiden Platten (MR003; MR007) hat das griechische Label Melting Records je 500 Kopien pressen lassen. Vom ersten Teil sind noch ca. 30 Exemplare auf Bandcamp verfügbar, von Vol. 2 dürfte es noch ausreichend geben. Holt Euch beide, es lohnt sich. 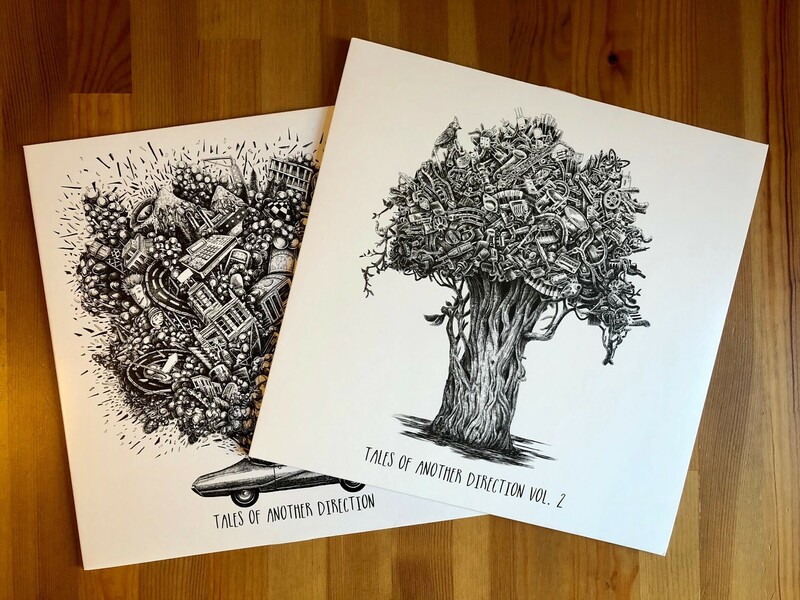 „Greece’s Melting Records close out 2017 with welcome return of the Tales of Another Direction compilation, now in its second volume. Tales of Another Direction Vol. 2 brings back some exciting Melting Records mainstays and introduces promising new talent, confirming the label’s ear-to-the-ground taste-making prowess. 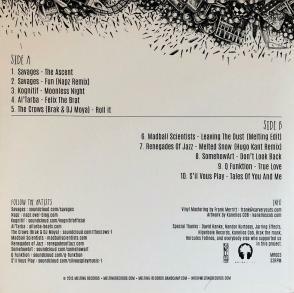 The ten track collection – not including the ‚bonus track‘ – is an aural journey in the best sense of the term, leading the listener down a jazzy pathway paved with trip hop, downtempo, and chilled electronic delights. Tales of Another Direction Vol. 2 opens with the seductive ‚Flyentists‘ by French producer Screenatorium, featuring beautiful, smokey vocals and hazy, lazy rhythms. ‚Deep Water‘ – by Renegades of Jazz side-project Keno – continues this intoxicating vibe with its beachside sounds, organ and loungey horn loops, and beckoning female vocal snippets. Other strong highlights include the classic trip hop sound of Kognitif’s „Flamant Rose“, Skinshape and Jon Moody’s ’70s noir throwback ‚Oboe Diddly‘, the tough, choppy beats and trippy sitar of ‚Growth Strategies‘ by Niles Philips (Timewarp, Inc), and the hypnotic ‚Primeira Sessão‘ by MPC bandits Billa Qause and Mononome. 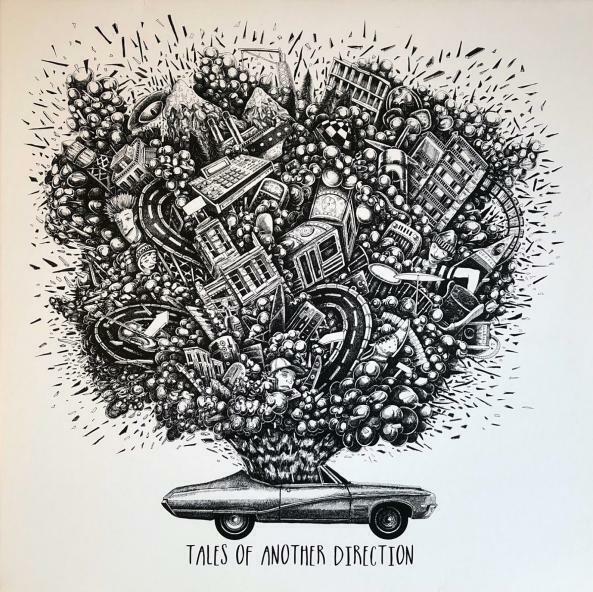 Meine Wertung: 9/10 für Tales of Another Direction Vol. 1 & 2. Beide Sampler bestechen mit jazzigen Samples und einer coolen Mischung aus Trip Hop und Instrumental Hip Hop. Auch hier kommt wieder zum tragen, was ich an diesen Compilations besonders mag: Various Artists. Viele, zum Teil mir unbekannte, Produzenten haben die beiden Platten mit knisternder Musik gefüllt. Von Vol. 1 kannte ich lediglich SomehowArt, bei Vol. 2 ist El Jazzy Chavo meine bekannte Grösse. Will heissen, es gab wieder eine Menge Neues für mich zu entdecken. So muss das und so macht das richtig Spass!